Sanchi, a major Buddhist hilltop complex located 46 km north east of Bhopal, and 10 km from Besnagar or Vidisha in the central part of the state of Madhya Pradesh, is famous for its group of stupas, monasteries, temples and pillars. Dating from the 3rd century BC to the12th century AD, these are the best preserved and most studied Buddhist sites in India. Designated by the UNESCO as a World Heritage site for its archaeological and historical importance, it was Ashoka, the Great Maurya Emperor who built the first stupa and a monolithic pillar (3rd century BC ) here. A great number of stupas and other structures such as railings, elaborately carved gateways, Buddha images etc were added over the succeeding centuries. 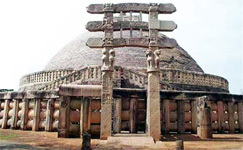 The great stupa also called Sanchi Stupa1 is the most famous of the stupa's in Sanchi. The majestic stupa, 36.5 mts in diameter and 16.4 mts high, with its massive hemispherical dome is one of the oldest stone structures in India. Originally built by the Mauryan Emperor Ashoka, the whole structure was rebuilt in its present larger form, in the middle of the 2nd century BC. The original brick stupa was enclosed within a stone encasing in the 3rd century BC. The last of the additions to this remarkable stupa are the elaborate and magnificently carved four gateways or 'Toranas', considered as the finest works of art at Sanchi and also the finest examples of Buddhist art in India. A railing encircles the stupa, its basic model consists of two upright pillars (8.5 meters high) that are square in shape joined by three horizontal beams or architraves with volute ends. Built in 35 BC, during the reign of the Satavahanans, these gateways are beautifully covered and carry explicit carvings which depict scenes mainly from the earlier lives of the Buddha (jataka), along with decorative elements like depiction of religious subjects, elephants or pot-bellied dwarves, a set of four lions, auspicious emblems, 'vriksha devatas' (symbolising different types of trees) etc. Here, the Buddha is portrayed in symbols: the lotus representing his birth, the tree his enlightenment, the wheel derived from the title of his first sermon, the footmarks and throne representing his presence. These have been carved with such inspired intensity and imagery that, taken together with the surrounding figures, they are considered to counter-balance the massive solidity of the stupa they encircle. The exterior Eastern Gateway of the upper arch has an illustration of the seven incarnations of the Buddha represented symbolically by two trees and five stupas. The middle arch illustrates scenes of the great departure, showing the young Prince Siddhartha Gautama, leaving and setting off on his journey towards nirvana (enlightenment). The lowest arch illustrates the great emperor Ashoka's visit to the Bodhi tree in Bodh Gaya (the site of Buddha's enlightenment). It also consists of a figure of a 'Yakshi' with flowing tresses hanging out on a tree which is one of the famous images in Sanchi as well as in Asia, and in the legendary stories from Buddha's ministry. The interior view has illustrations of the Buddha being worshipped by animals like lion, buffalos, deer, birds and some sheep with human-looking faces, and his relics being worshipped by nature spirits symbolized by elephants. Southern gateway is the oldest of all the gateways. The exterior of the upper arch of the Southern Gateway illustrates the blessings of nature in the form of rain at the time of the birth of Gautama which is symbolized by two elephants standing with their trunks raised. The middle archway depicts King Ashoka's visit to the Ramagrama stupa. The lowest archway mainly consists of decorative works. The top archway of the interior of the southern gateway illustrates Chhadanta Jataka, one of the volumes of Jataka tales (stories about the past life of the Buddha). Emperor Ashoka's royal symbol, now our national Emblem, a four lion capital motif is depicted on the south gate's pillar. The Western Gateway supported by pot-bellied dwarves depicts some of the most interesting scenes. The top archway of the exterior of the western gateway illustrates Buddha represented in the form of trees, the middle archway depicts Buddha delivering a sermon, and the lowest one a Chhadanta Jataka scene. The interior of the middle arch depicts the so-called War of the Relics, and the bottom one Mara's temptation of the Buddha, which happened just before enlightenment. The Northern Gateway crowned by a broken wheel of law, depict the miracles associated with Buddha as told in the Jatakas. It also depicts scenes of Buddha teaching at Shravasti, in a grove, at Kapilavastu etc. One of the best preserved of the gateways, it illustrates scenes including a monkey offering a bowl of honey to worship Buddha and a decorated Bodhi Tree. There are four elephants facing in four directions with swaying trunks and robust figures, which hold up the beams of the toran. Near the elephants are two sets of figures, the most sensuous depictions of 'salabhanjikas' or 'yakshis', sacred tree spirits, while horses with riders and more elephants fill the gaps between the architraves. The interior of the top archway in the northern gateway depicts Chhadanta Jataka, the middle arch has scenes from Buddha's life, and the lowest one scenes from the Vessantara Jataka. Other stupas : There are many other stupas on this hill which date from 3rd century AD. Eight were built by Ashoka but only three remain, including Stupa 1. Stupa no. 2. - The most notable feature of this stupa is the stone railing that surrounds it. The stupa that is located nearly at the rim of the hill have no gateways. Simpler than on Stupa 1, the medallions which decorate the surrounding wall is very attractive. Stupa no. 3. is situated north -east of the Great Stupa. The semicircular dome is topped with an umbrella of polished stone, as a mark of its special religious significance. It has only one gateway. The relics of Sariputta and Mahamogallena, two of Buddha's earliest disciples, were found in its inmost chambers. They were removed and taken to London in 1853 but returned to Sanchi in 1953. Stupa 4 and 5, near the great stupa, is almost totally in ruins. There are a number of pillars near the stupas. The famous of these is pillar10, the Ashoka Pillar which lies close to the southern gateway of the Great Stupa, known for its aesthetic proportions and exquisite structural balance. The state emblem of India, four back to back lions which once topped the column is an excellent example of Greco-Buddhist art. Pillar 25 (Sunga period 2nd century BC), 35 (5th century AD) etc are not as exceptional as pillar 10. A number of Viharas or monasteries have been excavated from the area. The earliest monasteries made of wood have long disappeared. The design of the Viharas is basically with a central courtyard surrounded by monastic cells. Monasteries 45 and 47 are located on the eastern edge of the hilltop. From these monasteries one can get a good view of the villages of Vidisha and Sanchi. Monastery 51 is located mid way down the hill on the western side. Temple 18, a chaitya situated to the south of Stupa I in classical Greek style, dates back to the 7th century. Near this, temple 17 (5th century) known as Gupta Temple is comparatively smaller, and is built in the same Greek style. This is one of the earliest known examples of temple architecture in India.. The large Temple 40, which is to the south east of temples 17 & 18, dates back to the Ashokan period. Temple 31 is adjacent to Stupa 5. It dates back to the 6th or 7th century and was reconstructed during the 10th or 11th century. Rectangular in shape with a flat roof, this temple has a Statue of Buddha which seems to have been shifted here from another temple as it does not quite exactly fit the pedestal on which it is placed. Below the hill at Sanchi, the Archeological Survey of India maintains a site museum. Noteworthy antiquities on display include the lion capital of the Ashokan pillar and metal objects used by the monks, a yakshi (maiden) hanging from a mango tree, and a beautiful Buddha figure in red sandstone discovered during the excavations at Sanchi. Open from 10 am to 5 pm daily except Fridays. The nearby monuments like the 2nd century B.C. Heliodoros Pillar, the 5the century A.D. Udayagiri Caves and the Lohangi Hill monuments in Vidisha are situated within a radious of 10km from Sanchi, and are well worth a visit.